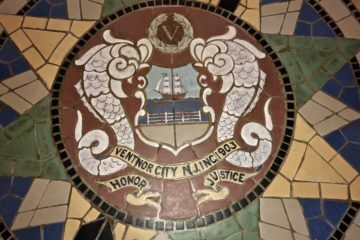 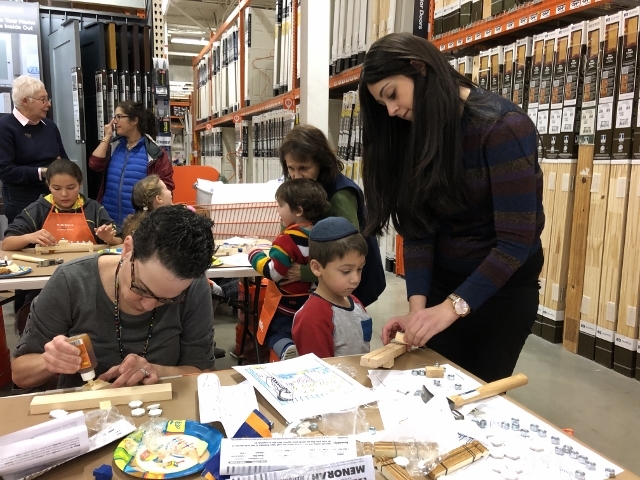 ABSECON – Children gathered with their parents Sunday, Dec. 1 to participate in a hands-on DIY workshop and learn about Jewish traditions surrounding the celebration of Hanukkah. 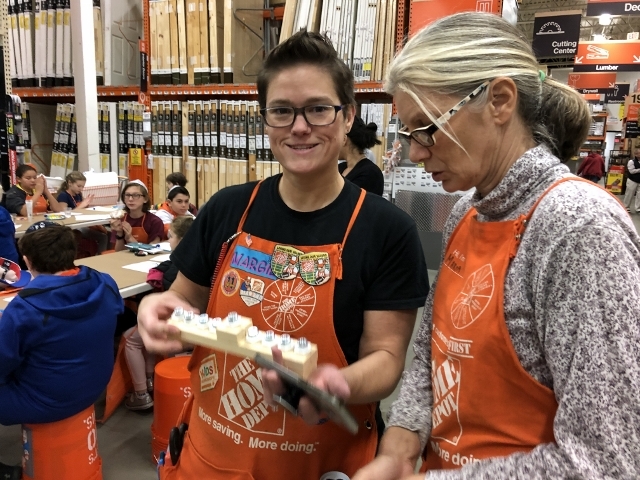 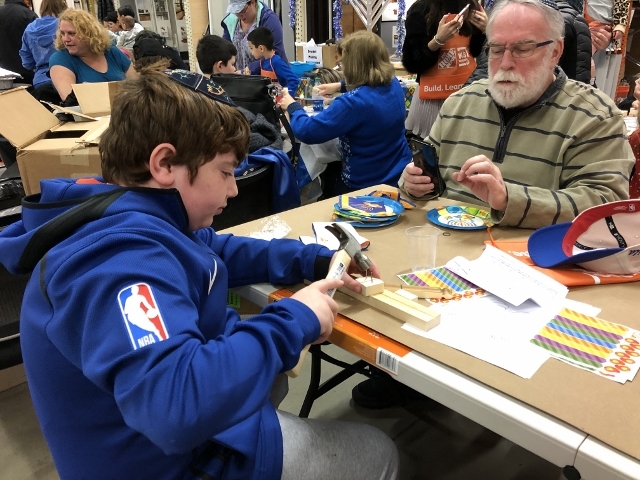 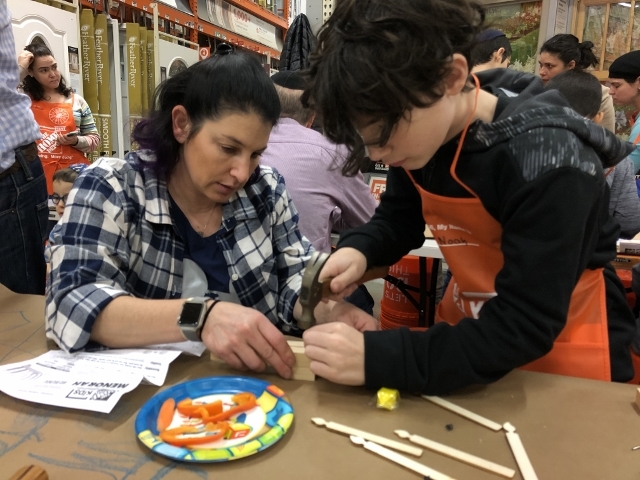 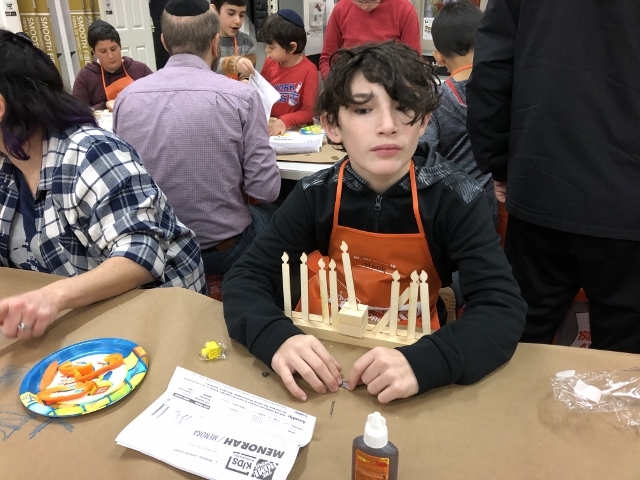 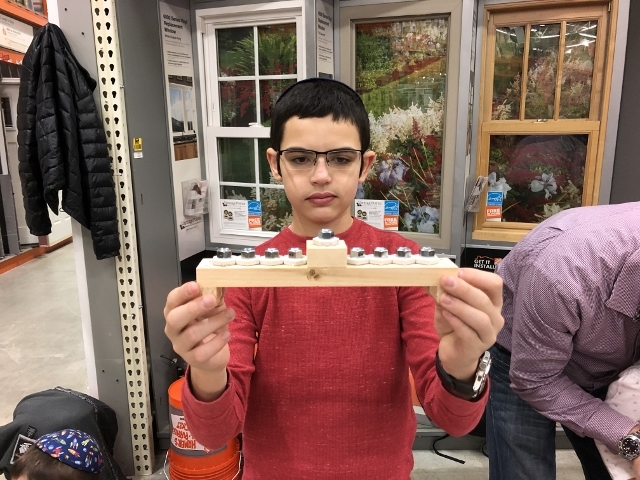 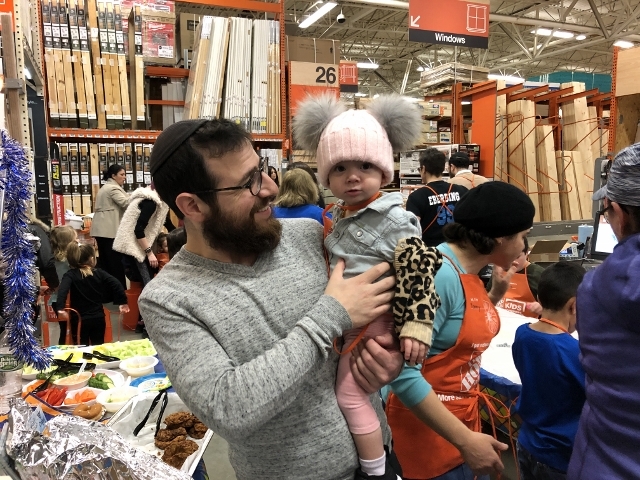 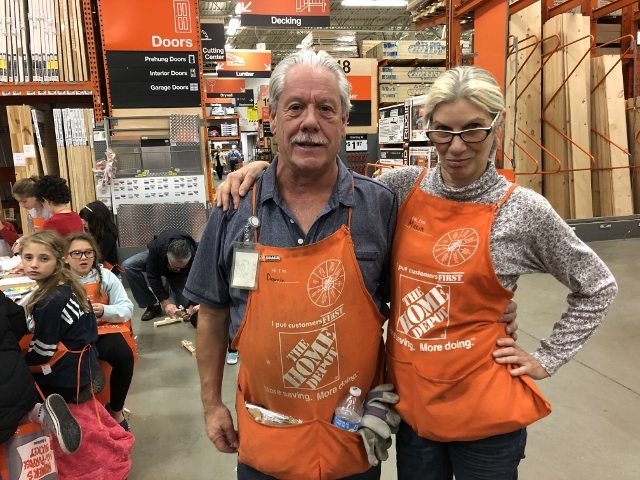 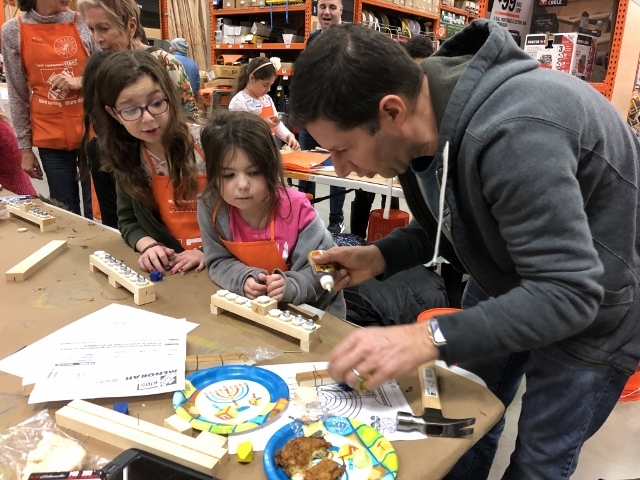 About 100 children, many members of the Ventnor Shul, and their parents made wooden menorahs at The Home Depot store in Absecon on the first day of Hanukkah. 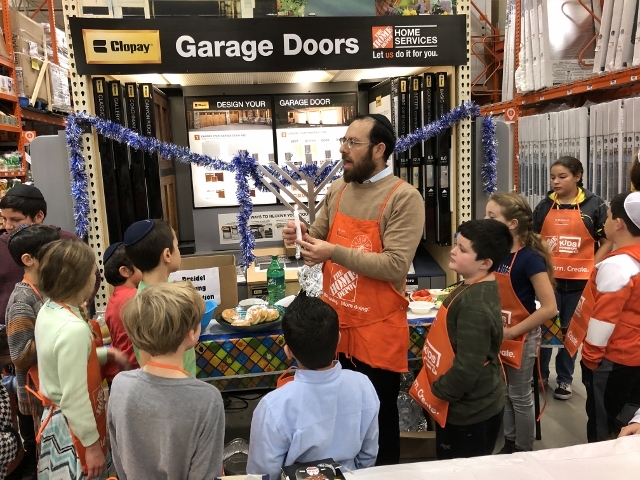 Rabbi Avrohom Rapoport quizzed the children on their knowledge of Hanukkah, which is know as the Jewish Festival of Lights. 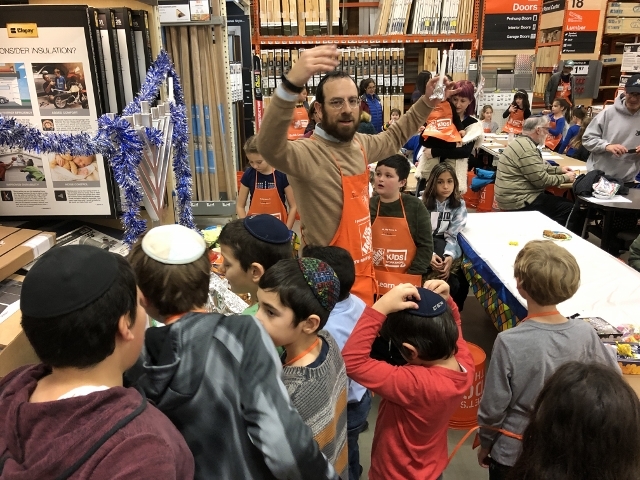 Before lighting the first candle on the menorah set up at the end of one of the many aisles in the home improvement store, Rapoport asked children about the Maccabees, who fought the religious persecution of Antioch, and the miracle that allowed one day’s worth of oil needed to light the temple last eight days until new sacred oil could be made. 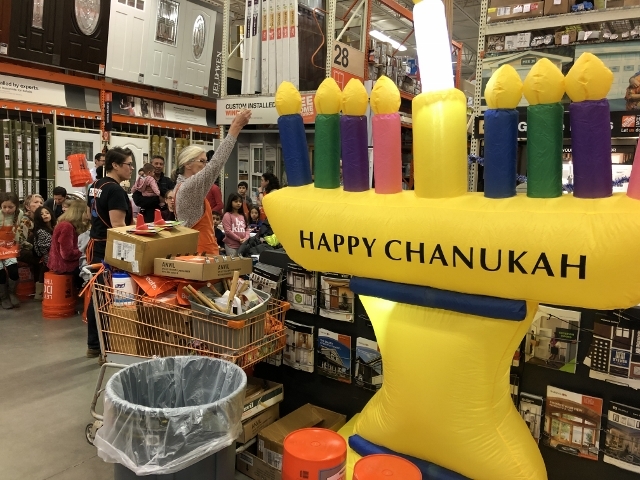 The festival of Hanukkah is celebrated over eight days with a nightly menorah lighting, songs and gift giving. 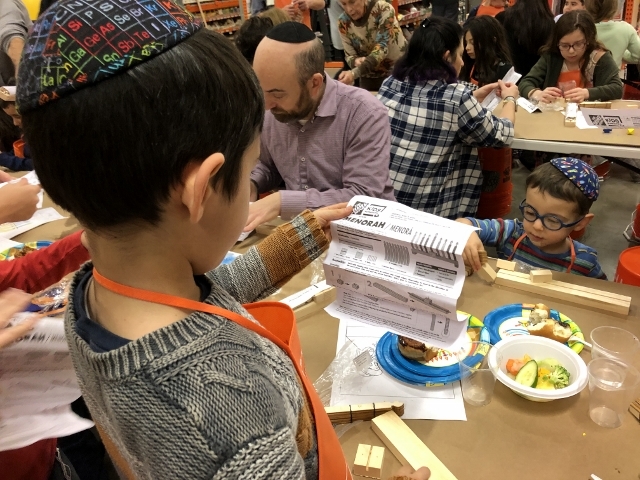 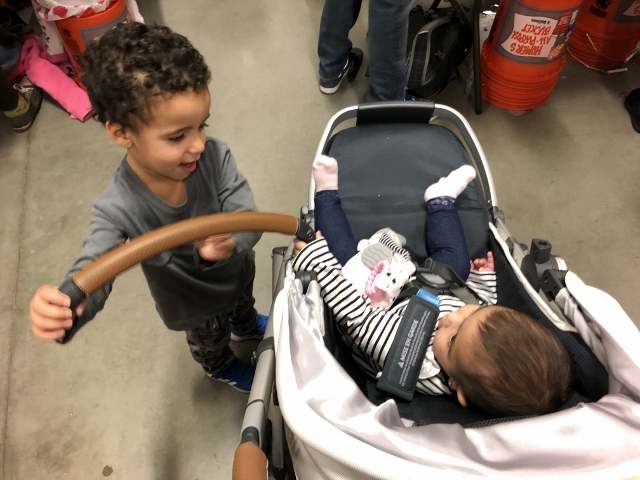 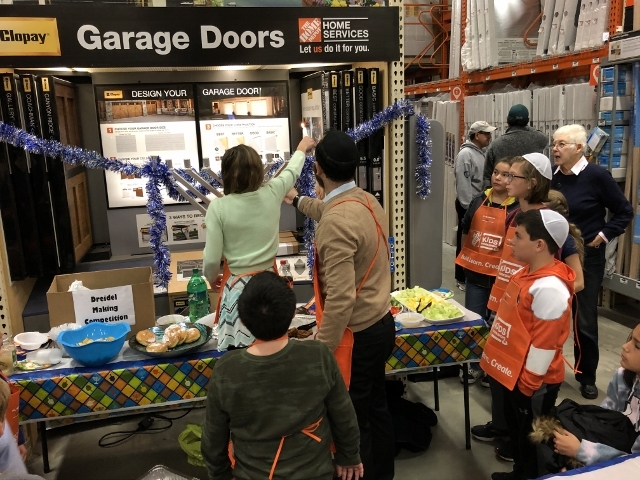 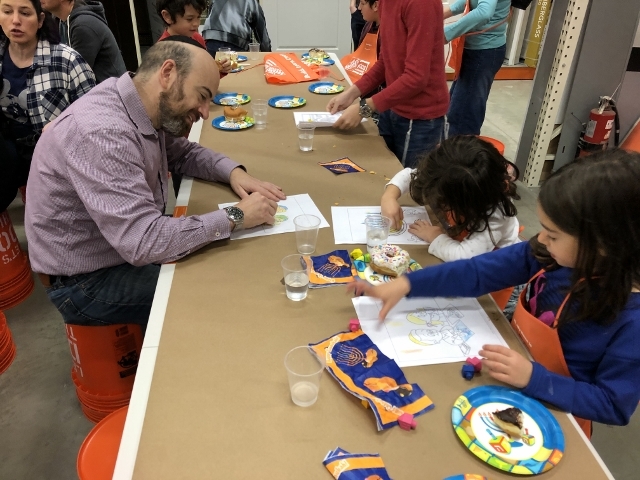 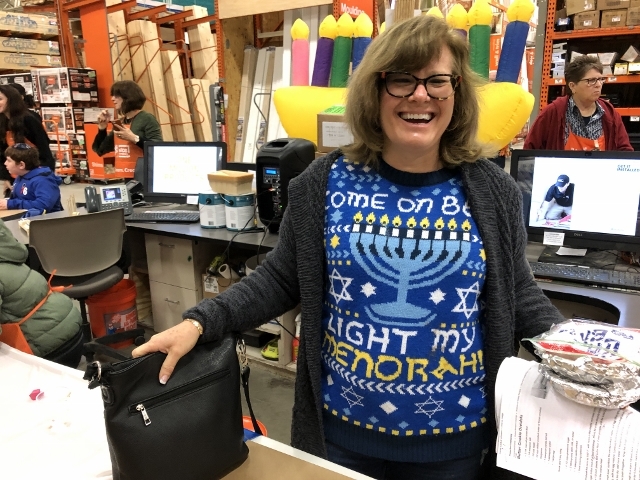 Children sang “The Dreidel Song” and ate the traditional oil-fried donuts and latkes before workers at The Home Depot distributed two types of menorah kits, one with candles and colorful stickers and the other with bolts and tiles. 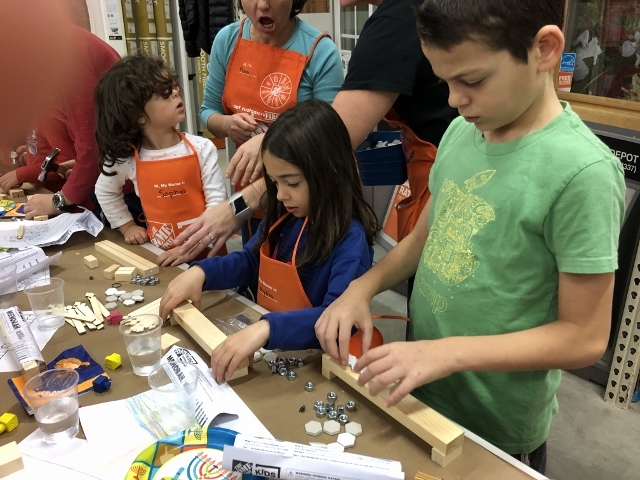 The older children chose the latter, and used small hammers to assemble their wooden bases. 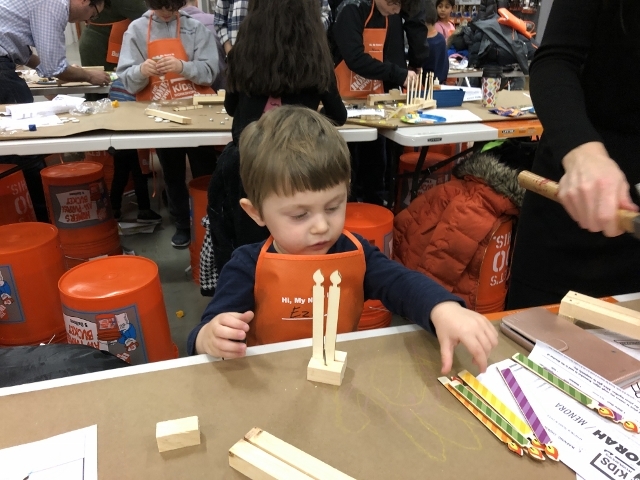 Nailing the blocks together on top of the plastic folding table was challenging until one bright child decided to do their banging on the concrete floor. 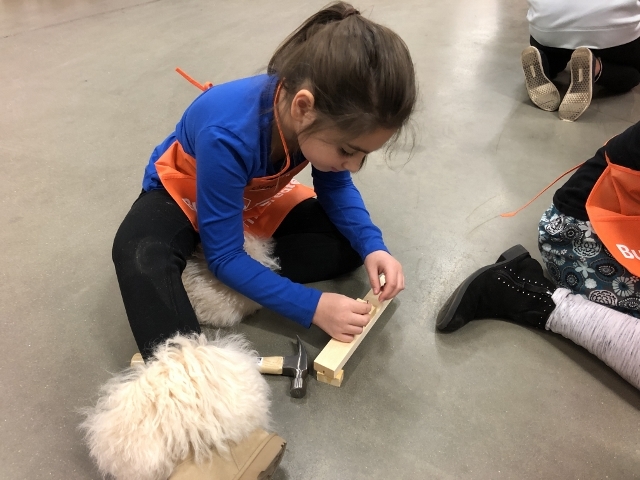 Many of the others followed suit, learning how to use a hammer as a lever to extract crooked nails. 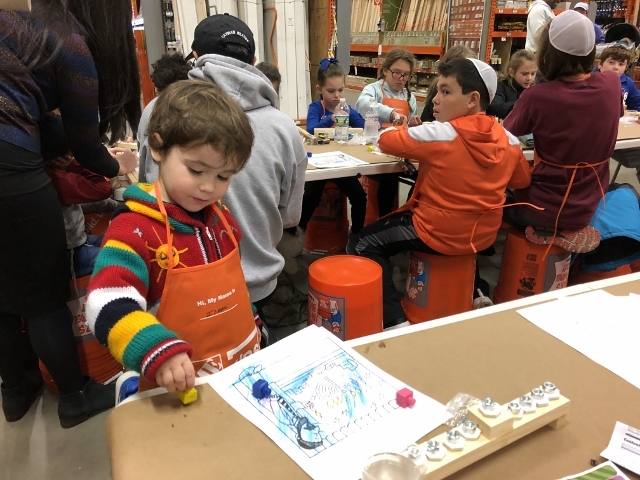 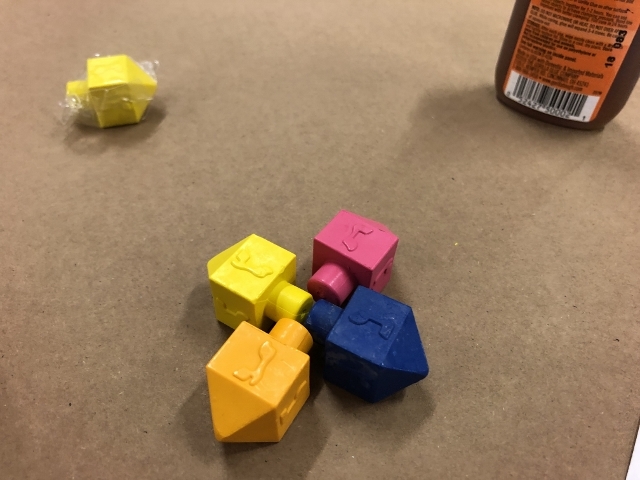 According to Maria Davidson of Galloway Township, who works at the store, the menorah making session was arranged well in advance, but the store also offers free monthly Kids DIY programs. 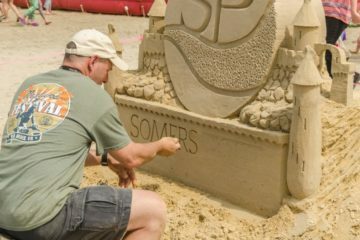 “We ususally get as many as 70 kids, so it’s good to give us advance notice for groups,” Davidson said. 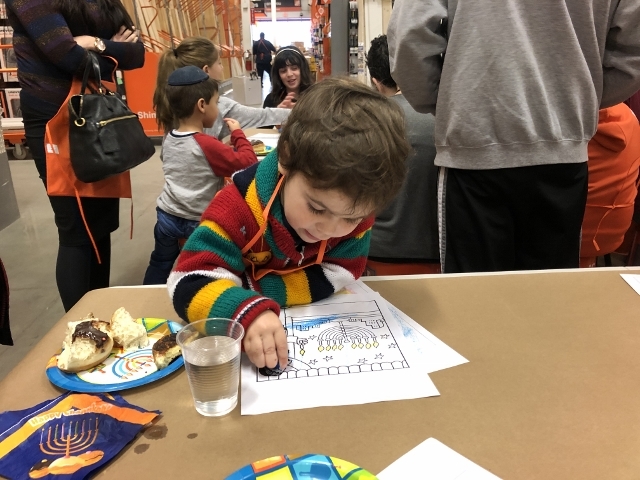 Children who participate get a Home Depot apron, project pin and certificate of achievement. 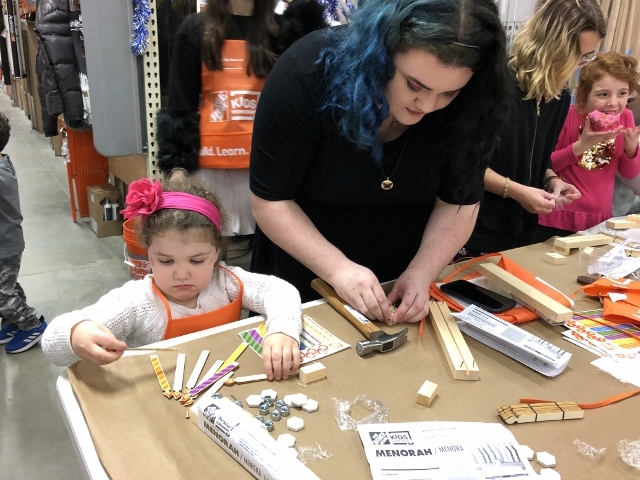 The Home Depot provides the kits at no cost. 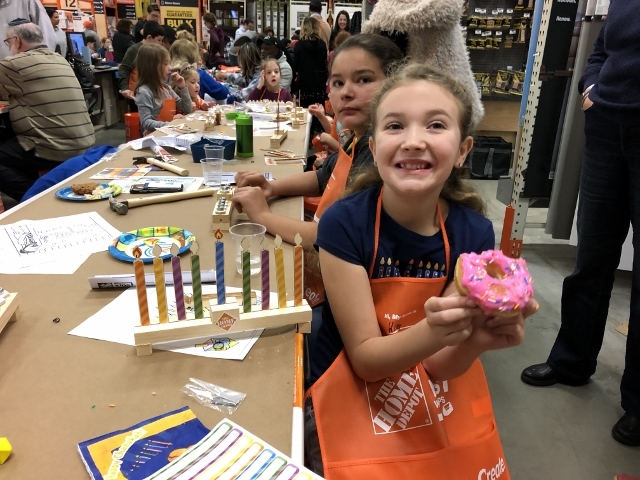 Davidson recommends registering in advance on the Home Depot website. 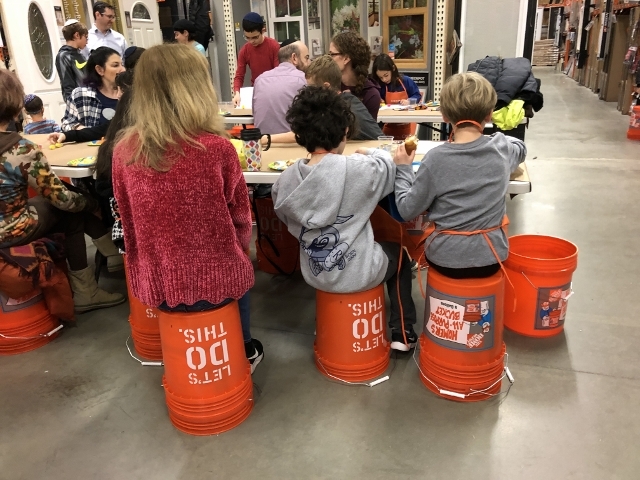 At the program being offered 9 a.m. – noon Saturday, Jan. 5, children will make their own easel and whiteboard.